The popular, Eddy-award-winning BusyCal calendaring application for Mac has been upgraded with an overhauled user interface, compatibility with Mountain Lion, and improved iCloud support. 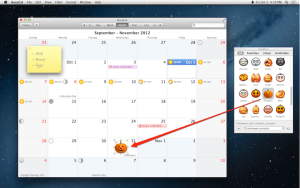 BusyCal 2.0 launched Monday, available only through the Mac App Store. The calendar view is now customizable, letting users view schedules according to date ranges—ranges that include a “year view” with a heat-mapping feature that allows users to see their busiest times of year at a glance. The improved “list view” can also be adjusted to use custom date ranges, and now includes a new “total duration” feature that lets professionals easily calculate their billable hours. 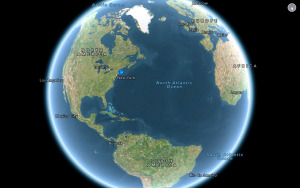 BusyCal 2.0 includes a graphics palette to spice up your view. Other new features include a ten-day weather forecast, as well as a new graphics palette to gussy up the calendar—users can stick a jack-o-lantern graphic on October 31, for example, to remind themselves to do candy shopping for Halloween. The app’s menubar icon has also been revamped; clicking it now reveals the current weather conditions, as well as a text field that lets you schedule new events using natural language, à la Fantastical. BusyMac says BusyCal also integrates with Mountain Lion’s Notification Center, and improved iCloud support makes it easier to share calendars between devices. 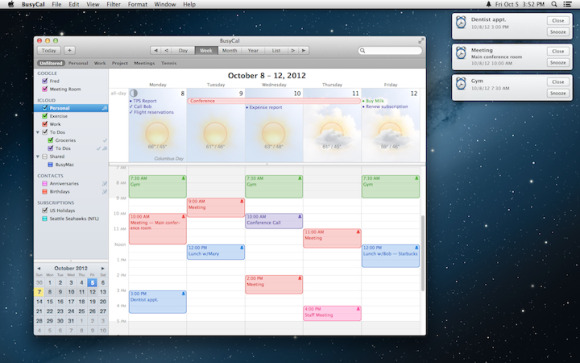 BusyCal is compatible with Apple’s native Calendar app, as well as the cloud-based Google Calendar service. It is not compatible with Microsoft Exchange. BusyCal 2.0 is currently available for $30, but a 30-day free trial is available on the company’s website. (The new version is a paid upgrade for users of the previous BusyCal 1.6.) It is compatible only with Macs running the Mountain Lion operating system, but it’s backwards-compatible with older versions on previous operating systems.